My mother was on the phone. The old black desk model with its rotary dial. She was writing with one hand, the receiver clenched between shoulder and ear, the coiled cord around her leg. I sat at her side with paper and crayon watching her make notes and I wrote along with her. However, because I was four at the time, my writing looked like this . But that’s how I started to write. I was desperately trying to imitate her cursive handwriting, that cryptic language that only grownups knew. How do we begin to write? What is the impetus for putting words on paper, bringing our thoughts to light? Even sharing them with others? I had thought I began to write a few years ago, after a lifetime of painting and a business and family. Turns out, I was always writing, always fascinated with language, telling stories. On Sunday drives from Queens into Old World Brooklyn, I’d sit with my brother in the back seat of the lime green ’57 Buick, on top of the crate filled with dry ice, in which my father kept the ice cream he sold door to door. We’d be off to visit grandmas and aunts and cousins, and I, a pudgy, quiet little boy in his Sunday best, made a game of reading all the signs along the way. I felt so brilliant when we’d pass the auto parts dealer each week, whose sign read MOPAR, and which I had deciphered to be short for ‘motor parts.’ Words were becoming my companions. At Grandma Becky’s apartment, over plates piled high with stuffed cabbage, drinking flavored seltzer, I listened to stories about the family, usually criticizing whoever wasn’t present, told in overlapping pitched voices laced with a generous sprinkling of Yiddish when they wanted to hide something from me. Those moments stay with you, and become the basis for the stories we write. For the full experience, click below. In grade school, I wrote stories that were inspired by the comic books I devoured, the TV shows I watched. Like a lot of kids, I had an early fascination with bad guys, so I wrote a story about ‘Lucky Louie,’ a gangster who stole diamonds and beat people up. That’s about all I remember about the story, but maybe now I can expand it into a screenplay. Next came essays in junior high. Sophomoric, hilarious, to me, diatribes on the injustices of teenage life told in the style of Mad Magazine’s “The Lighter Side of…” I took on crucial issues of the day, like dating, cheating on tests, my ineptitude at team sports. Written for myself, but perhaps with an eye to someday working for that glorious magazine. High school brought play writing, first in the form of a group effort at musical comedy, an intramural competition between grades performed at the end of the school year, then in an independent stab at writing a play in the style of Neil Simon, my comic hero at the time. The fun begins when a married couple has an acrimonious divorce but tries to live in the same apartment together. Hilarity ensues. Some years later a filmmaking project brought together four writers in search of a screenplay. We jointly wrote, directed and produced a film in the late seventies that anticipated “An Unmarried Woman,” the popular Paul Mazursky film that came out in 1978. Ours never saw the light of day, but hey, we learned how to make a film. And now I’m working on a third (or is it ninth?) revision of my novel, Big Shot, more bad guys and family stories, relationships and Yiddish and humor woven together into a historical telling of life in 1930s New York City. 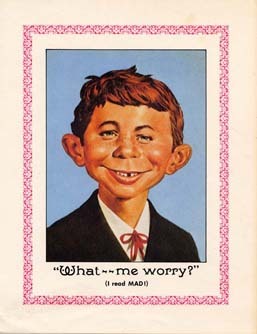 I hope to see it through to publication, but if by some horrible twist of fate I do not, I’ll have to call upon the wise words of Mad Magazine’s Alfred E. Neumann. Rob, your post is so deliciously vivid and evocative!! You’ll get there Rob, after all Lisa is right your writing is deliciously vivid and evocative. Your humorous but poignant piece brings back my own memories of writing as a child–telling stories as I drew, feeling exhilarated at the first full short story I wrote for an English assignment, creating a fictional newspaper for Latin class, complete with the comic strip “Peanutimus.” Thanks!